In my previous post, I wanted to address the inherent political implications of how erasure poetry refracts a document into another one. I also asked: How do some poets use the rupturing of a text in order to reclaim, redress, resist? How does the intentional absenting of language attempt to succeed where its presence cannot? With this in mind, Zong! by M. NourbeSe Philip is a hefty book: 224 pages of experiments with erasure, based on a two-page legal report, Gregson v. Gilbert, that delineates the murderous drowning of 150 Africans so that the captain of a slave ship could collect insurance. By the ship’s owner and by history and language have bodies been erased, lives erased, voices erased. When you consider how Zong! is essentially made of holes and leftover language, the project becomes a compelling contradiction of destruction and creation. Indeed, how does one tell (and not tell) a story that can no longer be told? The very fact of physically mutilating the text broke the spell that the completed text has on us. I use the word “mutilate” with great deliberation here since I was deeply aware at the time I worked on Zong! that the intent of the transatlantic slave trade was to mutilate—languages, cultures, people, communities and histories—in the effort of a great capitalist enterprise. And I would argue that erasure is intrinsic to colonial and imperial projects. It’s an erasure that continues up to the present. The impetus was to uncover the personal stories as if they were literally hidden in the text of the document; erasure allowed Philip to “refract” this document in a way that reframes the viewpoint, the focus, and the truths articulated in it. What I am also interested in is how for Philip, enacting physical violence and erasure to the document is integral in revealing the historical violence and erasure that underlies the document. Visually, words, phrases, fragments of sounds and silences are scattered across the pages like bones. Everywhere are ghosts and evidence of what cannot be recovered. To understand the impact of the form—of refraction—we might consider its absence. Philip could have attempted to tell the stories of these African slaves straightforwardly or separately on their own. But the intimacy of extracting their voices literally from the text of Greyson v. Gilbert forces the reader to hold both documents at the same time, continuously confronted with the impact of the gap between history and body, how the two are separated—in each direction, literally and formally—by an act of obliteration. Philip underscores how historical documents are inherently political. There is significance, then, in the disruption/destruction of this document: the violence of the form as recompense, retaliation, remonstration against the violence of the original document. As readers, we bear witness, we participate, and we are also made complicit in history's erasure—we ourselves take up the empty spaces, filling it with our own individual consciousnesses. The silence is the inarticulability of personhood, is history’s violence, and is our complicity. 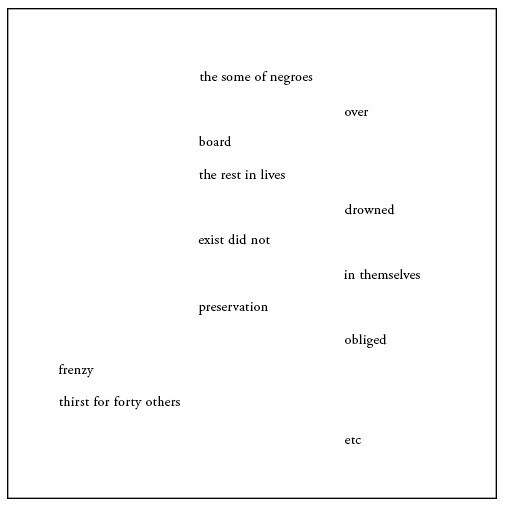 Erasure as prism: the scattering of a bounded text into fragments, pieces, shards. Indeed, Philip describes how her erasure experiments are not simply of subtraction but also of “shattering the words of the text into spore words which then arranged themselves.” By the end of the book, Philip creates a whole new language made of these splinters, and many of the pages develop a visual density. The original document excavates to render invisible; Philip excavates further to unbury; somehow by locating the holes, an evincing, at least in part. Quotations are from an interview “The Weight of What’s Left [Out]” conducted by Andrew David King in the Kenyon Review blog, Nov. 6, 2012. The collection of words “song, moan, shout, oath, ululation, curse, and chant” is from the book’s back cover description (Weslyan University Press, 2011).